2014 Calendar Year Photo Recap of Lake St. Clair Activities…. Certainly couldn’t be at all the events, but was able to make a lot of them! So many things to do here! Visit and like www.facebook.com/thelakestclairguide for posts & photos like this throughout the year to keep on top of what’s going on around Lake St. Clair! January – The Fair Haven – Bouvier Bay on Lake St. Clair – launch ramp in full swing with snowmobile racing and ice fishermen. January – Freighters were still running with the help on the ice cutters. January – Coast Guard Cutter was very busy through the spring. February – Delivering the just printed 2014 Lake St. Clair Guide Magazine to the Canadian marinas of Lake St. Clair… it was COLD! February – Bouvier Bay on Lake St. Clair is where the weekend racing and parties are in January and February. February – Aerial view of plowed drag strips used for weekend racing on Lake St. Clair. Thank you Peter Dugdale for the aerial photo! February – Ice fishing is popular all around Lake St. Clair. This photo is Northern L’Anse Creuse Bay near the Clinton River Cut Off DNR Ramp, next to the Sportsmens Direct BaitShop. February – Lots of snow for the snowmobilers on Lake St. Clair. Yes, we are starting to think about boating now…..
March – Aerial of the Coast Guard Cutters on the St. Clair River. May – Spring has finally sprung and the Clinton River Cruise boat is out. May – One of many spring storms …. our water levels are really on the rise from the big snow pack… hence the muddy water in our bay. May 21 – We witness the first swimmer… I removed my winter hat and gloves when we went over to talk to them! May – Boats are still slow to launch, but everyone had their waverunners in early! May – Fishing was chilly but had good results! May – Smallmouth caught by lots of visitors from out-of-state and our local anglers. May – Pike were also very popular late spring and all summer. Beautiful sunset over northern Anchor Bay. June – All the big dogs are now coming out of the barn…. June – Let the fun begin! Some warmer weather… the water temperatures were quite challenging yet for us swimmers. June – Smallmouth fishing… was getting better as the water temperature reached its peak for spawning. June – You go girl! Double header of smallmouth. June – The annual Anchor Bay Tastefest held in New Baltimore had many crowd favorite restaurants again. June – Was the 50th Year Celebration for the New Baltimore Fishfly Festival. Bought this new t- shirt for nostalgia. June – Tin Fish Restaurant hosted several fun events, including Pirate Palooza. 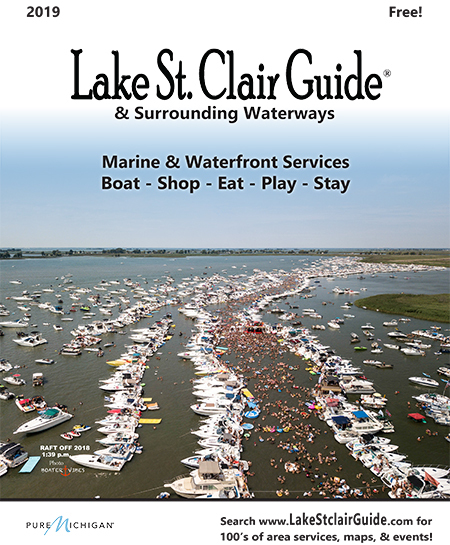 June – Lake St. Clair and the St. Clair River host several Antique Boat Shows throughout the season. June – Smallmouth bass fishing at its best with the kids! Michigan offers one free fishing weekend each June. June – Countless beautiful sunsets over Lake St. Clair. June – Annual Poker Run on Lake St. Clair for Michigan Special OIympics… This was Stop #2 at the Tin Fish in St. Clair Shores @ Jefferson Beach Marina …. what a fun day! June – Jobbie Nooner the last Friday of June each year held on Gull Island, near the entrance of the South Channel. Thanks Chip Miller for the awesome aerial drone photo! June – Jobbie Nooner from my perspective. Was a perfect day! Gull Island was noticeably smaller with the higher water levels. June – DNR Controlled burn of Dickenson Island marsh area on Jobbie Nooner day. Caused quite the stir with ash falling out of the sky early evening onto our houses and boats. June – The swans are out with their babies. June – Had to be the most photographed boat this summer…. A Mayea Boat Works beauty. Saw it a few times around the North Channel area. June …. Swimming areas all around Lake St. Clair are now filled each weekend. July… Annual Algonac Lions Pickerel Tournament for local charities. Always a fun time at this St. Clair River festival. It’s 4th of July! Heard on Facebook that PGA Collision in Chesterfield had just painted this boat. July – The Muskie fishermen are out! July – Annual Ohio visitor showing me where to smallmouth bass fish. July – Painted sky sunset reflection over Bouvier Bay on Lake St. Clair. July…..The swan babies are growing. July – White flowers are blooming on the lily pads. July – Yellow flowers are poking up. July – The 19th annual Sunsplash Festival takes places on the Belle River, Town of Lakeshore …. southern end of Lake St. Clair in Ontario, Canada. Bands, beer, cars, and fun by the marina. July – The Tashmoo Days Festival celebrates its 2nd year on Harsen’s Island. July – Annual Venetian Fest on the Nautical Mile in St. Clair Shores with many participants. July – Pretty purple flowers now in bloom around the St. Clair Flats. July – Sailboat school on the Detroit River with lots of kids …. July – Offshore racing in the city of St. Clair… on the St. Clair River. Big bands, big boats, and lots of fun! 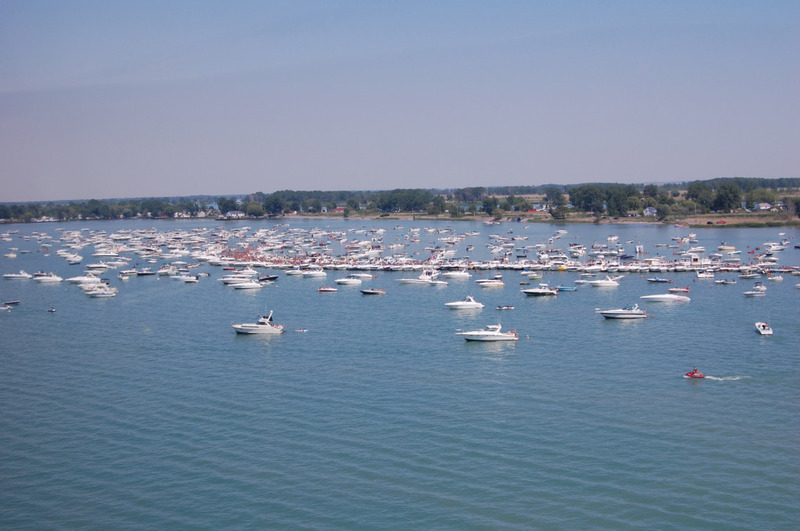 July – Aquapalooza – Live music and 1000’s of people on Anchor Bay in front of Belle Maer Harbor. Hope you didn’t get caught in that huge thunderstorm at the end of it on Sunday! July – Beautiful antique boat cruising the Detroit River approaching downtown Detroit. July – Ahh… another summer sunset over Lake St. Clair. 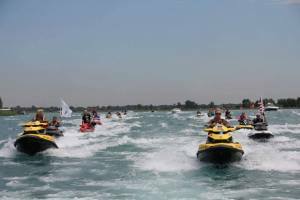 July – The Water Warriors waverunner event from Mackinac to Harsen’s Island begins! Benefit for Michigan Special Olympics each year. July – Big Fish Charters with big catch! July – Saw several huge yachts cruising through Lake St. Clair from other states, like this one from Ohio. Boat Town Festival of Lights on again cruising the Clinton River into Lake St. Clair … thanks to sponsorship of Markley Marine to help make it happen. 25 boats participated! August – Several car shows held around the waterfront of Lake St. Clair …including the Bash at the Beach @ Lake St. Clair Metropark. August – Saw some new birds this year in the St. Clair Flats. After lively Facebook contributions, we agreed they were Sand Hill Cranes. August – “Made in Detroit” leaving Brown’s Bar on Harsen’s Island… everyone stopped to look… had to, it was too loud to talk!! August – Annual fisherman from Indiana here with one of his muskie. August – The water is now 78 degrees and I’m in! August – 3rd offshore race this year around Lake St. Clair … this one in Port Huron on the St. Clair River! August – It’s the 10th Anniversary of the “Raft Off” held in Muscamoot Bay! August – The U.S. Brig Niagara stopped in Algonac on the St. Clair River for a weekend. August – The calm before the storm at the Tin Fish Restaurant on Anchor Bay in Fair Haven. Love our beautiful clear blue water. August – Enjoying a calm evening and a burger at the Island Grill, Mayea Marina, on Bouvier Bay, northern Lake St. Clair. August – The Detroit skyline on the Detroit River on a calm day for a long trip down to Wyandotte for dinner. August – Saw lots of tugs pulling barges on Lake St. Clair. August – Annual Algonac Art Fair on the St. Clair River. I bought a giant red hand made deck chair that won’t blow away in a storm. Lots of interesting crafts and art, and a great view on the boardwalk! August – Big boat from Sarnia coming into dock….everyone watching … even the dogs were impressed. August – Annual cardboard regatta at the Algonac Harbour Club. Surprising to me, most of the boats floated well… and captains as young as 4 year’s old were not as afraid as their parents were watching! September – Made it to Decker’s Landing before a big storm hit… Great rainbows after it cleared over the North Channel. September – New waterfront restaurant with dockage opens on Lake St. Clair! Sunset Bay on Northern Anchor / Bouvier Bay in front of Munchies swim area. September – Sturgeon season in full swing on the North Channel. September – Bassmaster Northern Open held on Lake St. Clair with 150 pro boats! September – Finally after a 3 year wait, we have the air show again over Anchor Bay. September – The Blue Angels put on a great show for us boaters. September – More Blue Angels superb flying. September – The annual boat show at Lake St. Clair Metropark…. had more boats this year than we’ve seen in probably 10 years…. gets better every year! September – Been a challenge, but we’re starting to find the perch in the shipping channel of Lake St. Clair. September – Nice catch of several big ones around Grassy Island in Anchor Bay’s Lake St. Clair.